Suzan Mazur has responded to Hugh Eakin's New Yorker interview with Marion True and highlighted some of the unasked questions ("Bob Hecht: Fragments Of An Antiquities Conspiracy? ", scoop.co.nz, December 28, 2007). Mazur draws attention to Rita Reif's 1988 New York Times commentary on the Atlantis Antiquities sale (Suzan Mazur, "Add New York Times To Bob Hecht Antiquities Ring "Organigram"?, scoop.co.nz, August 17, 2006). 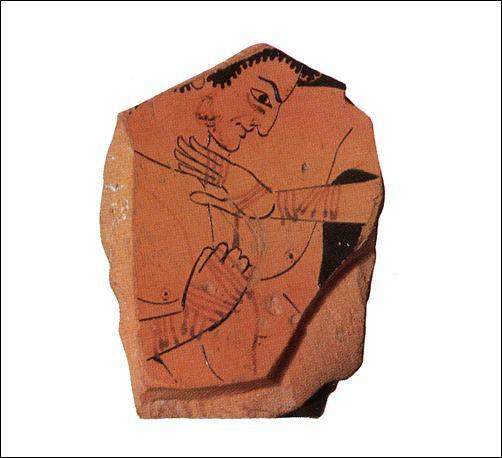 Fragmentary Attic cup showing Thracian boxer sold by Atlantis Antiquities.